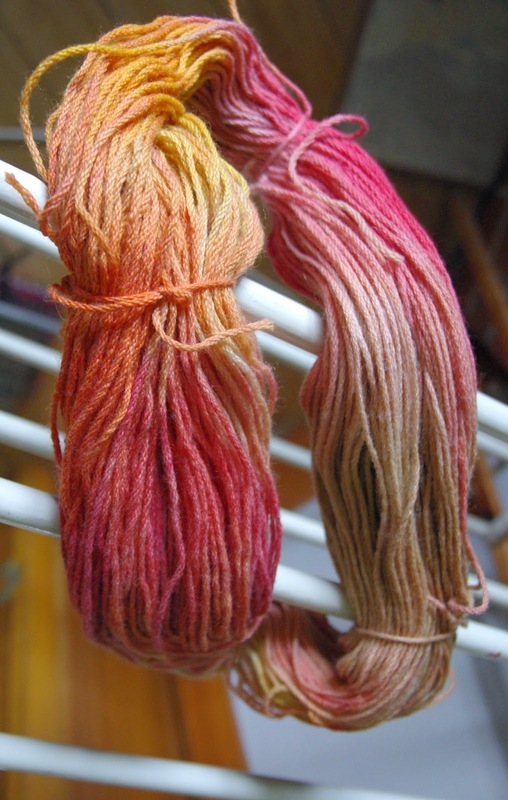 One of my New Years Resolutions is to learn to dye yarn. 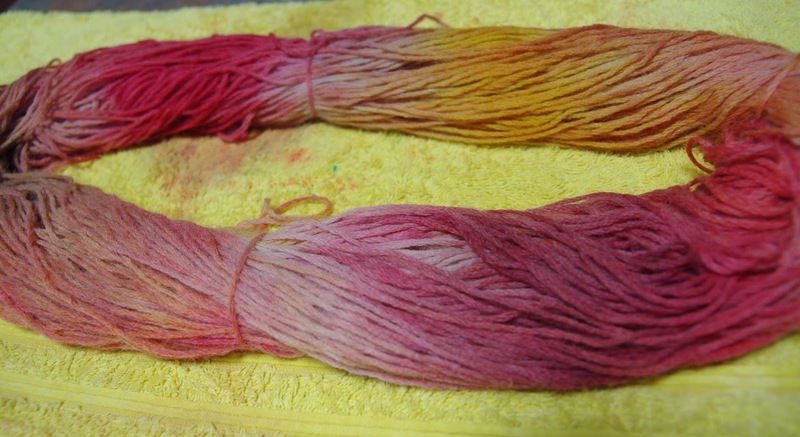 So what a better time to dye some yarn than New Year's Day? Messy stuff and holidays go together. Yarn - needs to be 100% natural animal fibre for best results, e.g. wool, alpaca, mohair, angora, cashmere. Acrylic and cotton need different techniques. Towels, paper towels, old rags, etc... to protect your bench tops from looking like a rainbow. Rubber gloves (after all you don't want to dye your hands the color of the rainbow) and an apron if you are a habitually messy cook. The good thing about food coloring is that it does wash out / clean up reasonably well if there are spills. Skein up your yarn. I used three balls of aran weight beige / fawnish up-cycled yarn from unraveled jumpers that came from an op shop / charity store / thrift store. For greatest success natural animal fibre is recommended, such as wool, alpaca, angora, etc... This is wool. (And even better it was cheap and I could afford to destroy it potentially if it all went horribly wrong). I wrapped the yarn around the back of a kitchen chair and tied it off in four places fairly loosely. 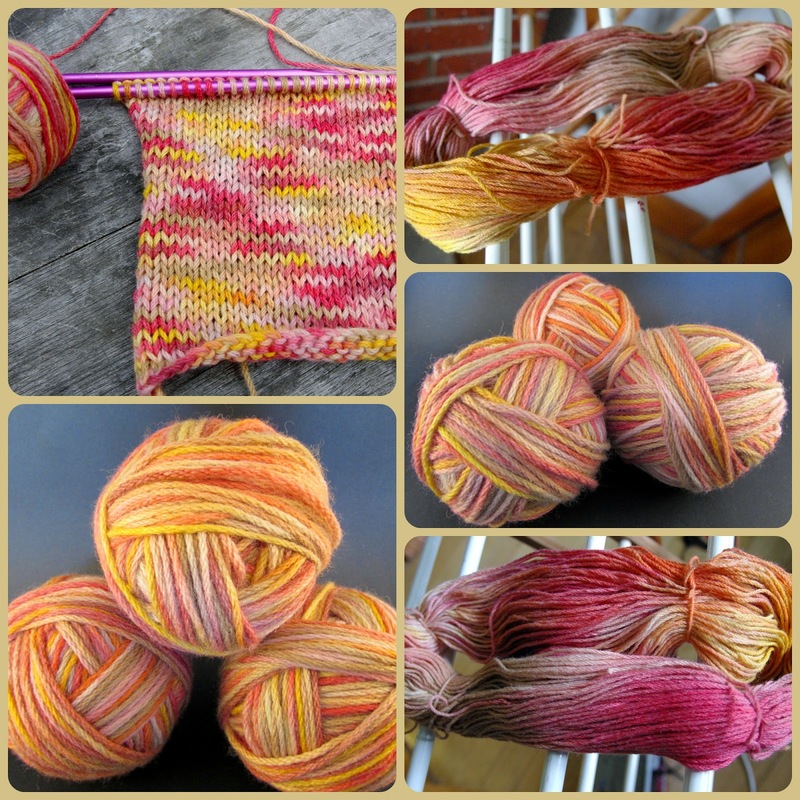 Mordant your yarn. A mordant is a substance, typically an inorganic oxide, that combines with a dye or stain and fixes it in a material. This step is essentially preparing the yarn to accept and hold dye. The simplest mordant is vinegar. (Note: This works if you are using food colouring as the dye. 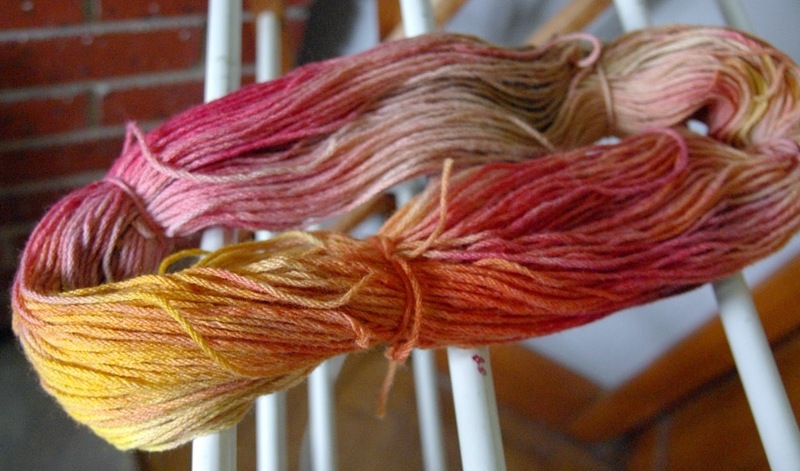 If you are using plant based dyes such as onion skins, you need a chemical mordant). 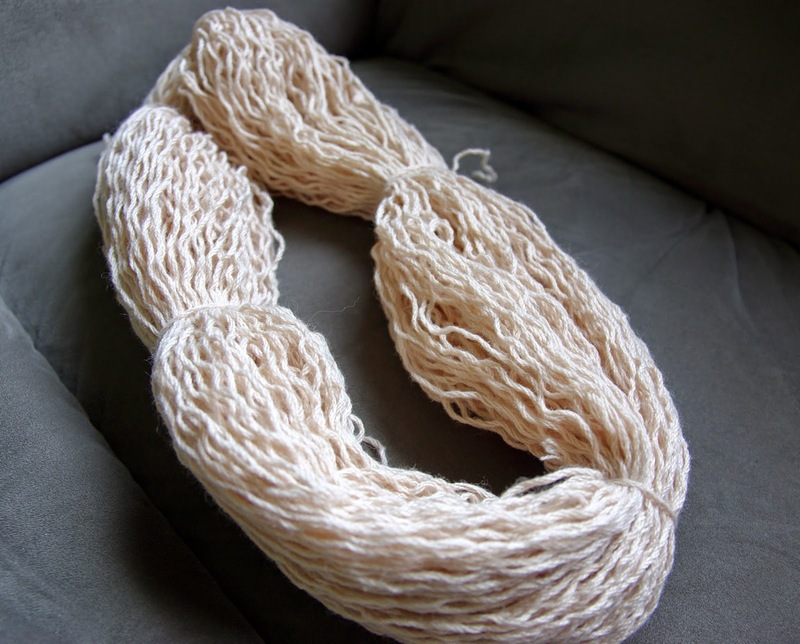 Use equal parts of warm water and white household vinegar soak your yarn thoroughly. 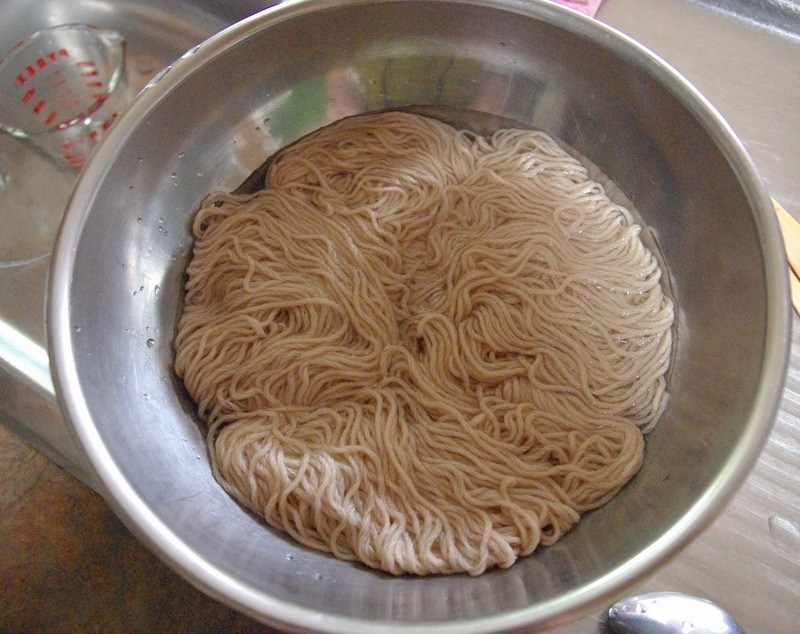 (For my skein it was two cups of white vinegar to two cups of warm water). Leave it long enough to soak through properly; at least an hour at minimum but it could be as long as overnight. Set up for dyeing. 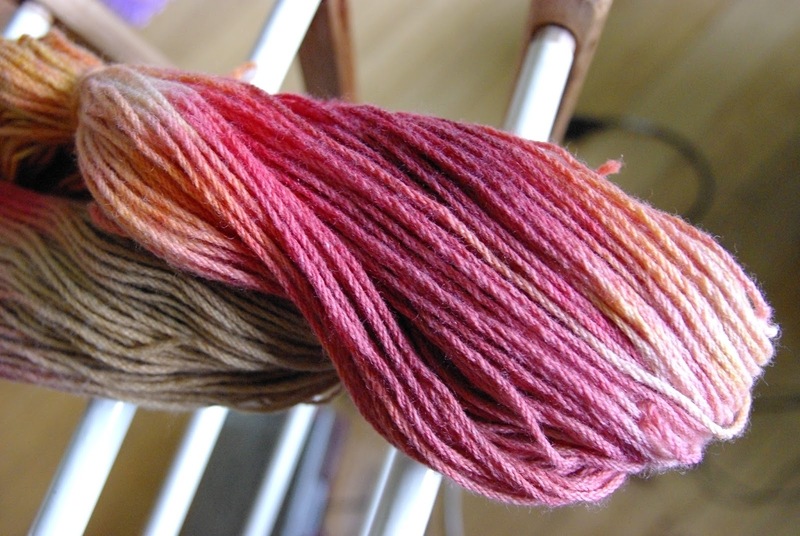 Remove the skein from the vinegar solution and wring out gently and pat dry. The yarn should be damp but not dripping. I've covered my kitchen bench with an old towel and then laid a sheet of cling film / plastic wrap on top of this. 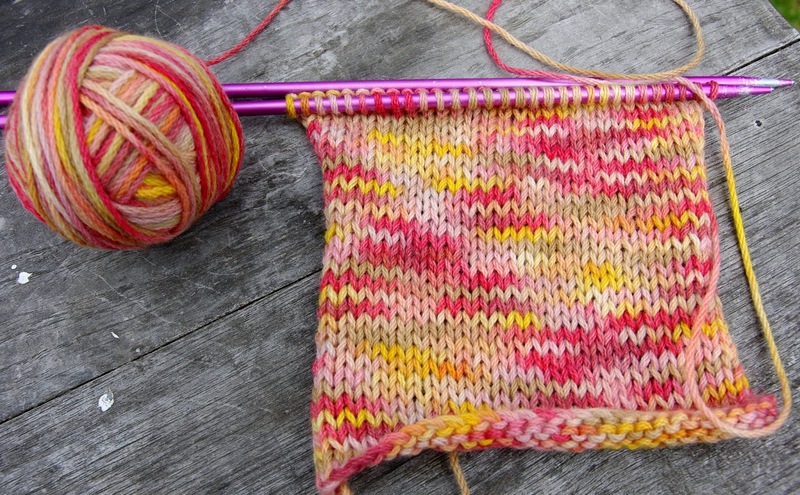 Then arrange the skein on top of this reasonably spread out and without any major twists and tangles. Dye the yarn all the pretty colours. This is the fun creative bit. We used yellow and red food coloring as well as very strong black coffee and a mixed berry fruit based tea infusion. I would fondly refer to this as kitchen cupboard dying. The coffee and tea were an experiment that didn't really work out as well as the food coloring. They didn't provide the intensity of color of the food coloring and didn't set and stay as strongly in the finished yarn. Squirt / dribble the food coloring on the yarn in the pattern of your choice. We've gone for short bands of color here. Mix up specific colors first if you want. There is some orange and purplish red in here as well. We were going for sunset / sunrise colors. Massage the color well into the yarn. Wear rubber gloves unless you want weird and wonderfully colored hands. 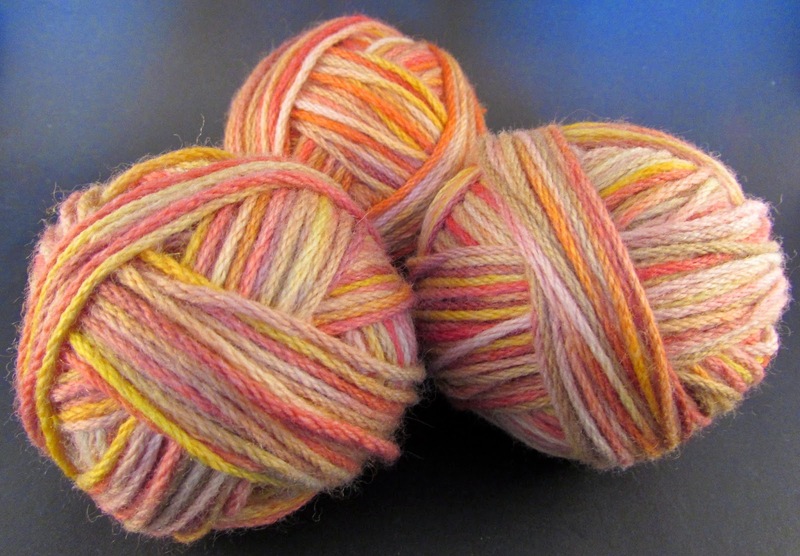 You can color the whole skein or leave some gaps of the original yarn color as we did. This takes more food color than you might anticipate. Our one skein used two small half bottles of food coloring, a small cup of strong coffee and about 50 ml of very strong fruit tea infusion. We could definitely have done with more food coloring. Micronuke the hell out it. 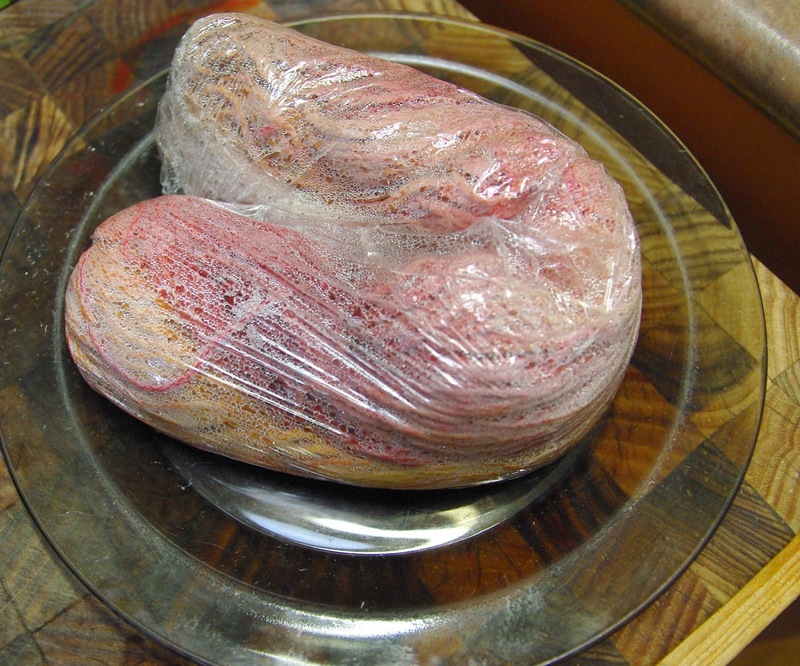 Wrap the yarn firmly in the cling film / plastic wrap to make a giant sausage shape. Place in a glass casserole dish or on a microwave proof plate and microwave on your microwave's highest setting. Remove yarn from the microwave and allow to cool. Do not unwrap the yarn. It should look like it does below with condensation on the inside of the plastic film. Once cool, place the yarn back in the microwave for another 5 minutes. Remove from microwave and allow to cool. Remove and discard the plastic wrap. Rinse the yarn thoroughly under warm water until the water runs clear. It was at this stage that I realized the coffee and tea hadn't worked as well as I would have like as they rinsed out a lot. 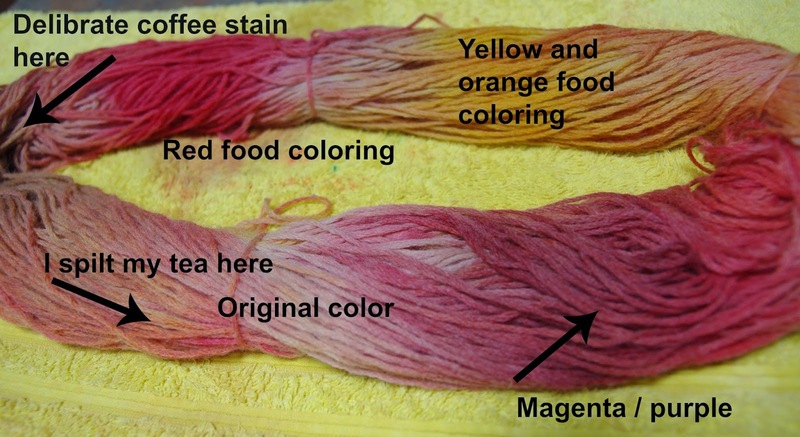 (I suspect that they need a chemical mordant as they are essentially plant based dyes). The food coloring held very well. Drape the yarn to dry in place out of the sun. Mine is on the drying rack in the lounge room. Photograph the pretty yarn from all its best angles. 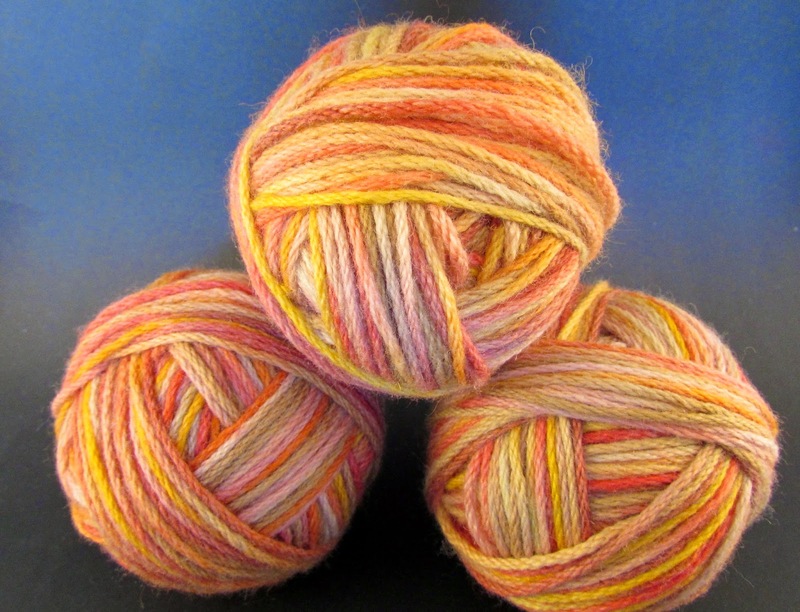 Once its totally dry make a cool twisted skein or roll into into balls or cakes. Swatch and see how it knits up. Then plan a pretty project. (This is going to be cabled armwarmers and a matching hat). One successful New Year's resolution. Very pretty! I would never have predicted that fabric when it was in the skein. 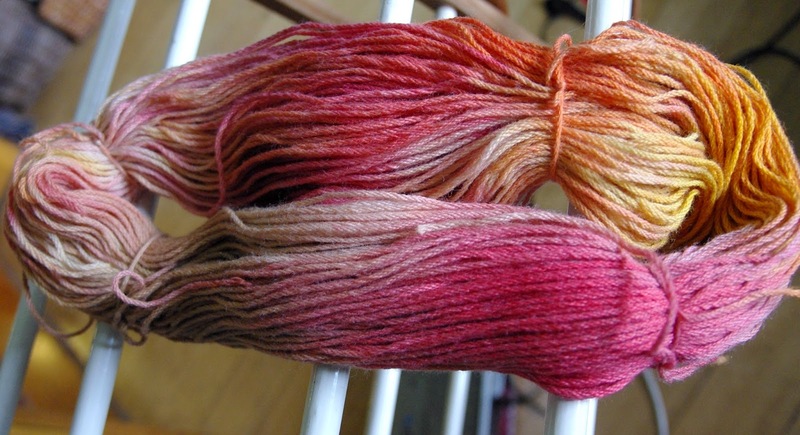 Dyeing is such an exercise in surprise and (mostly) delight!